Marsh, James H.. "Churchill Falls". The Canadian Encyclopedia, 23 June 2016, Historica Canada. https://www.thecanadianencyclopedia.ca/en/article/churchill-falls. Accessed 20 April 2019. 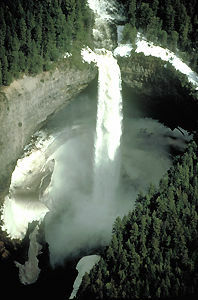 Churchill Falls is one of Canada's great waterfalls and the source of one of the world's largest electric power developments (photo by J. Kraulis). Churchill Falls, Labrador. The Churchill River drops some 66 m before plummeting 75 m over the falls and a further 158 m through Bowdoin Canyon. The Montagnais-Naskapi believed that to look on the awesome falls meant death. John McLean was the first white man to see the falls (1839), but they were largely forgotten until Albert Peter Low made a scientific excursion to the area in 1894. The massive hydroelectric potential of the falls was realized early on, but it was not until the completion of the Quebec, North Shore and Labrador Railway in 1954 and the development of long-distance electric-power transmission technology by Hydro-Québec that exploitation became feasible. Complex negotiations between the governments of Newfoundland and Québec (through which the power would have to pass) were not completed until 1969. The contract provided for the sale of 5.2 million kW per year of power to Hydro-Québec for 40 years at a price of under 3 mills (three-tenths of one cent) per kWh. Hydro-Québec has the option to renew for another 25 years at only 2 mills per kWh. 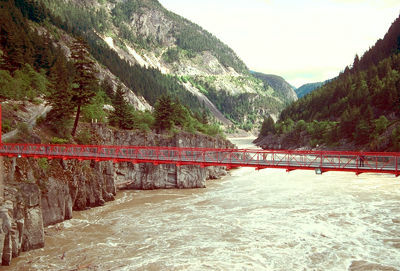 The project was undertaken by a subsidiary of British Newfoundland Corp Ltd (Brinco), and was at the time the largest civil engineering project ever undertaken in North America. Eighty strategically placed dikes pooled the vast waters of the Labrador Plateau in the Smallwood Reservoir. A massive underground powerhouse - until the James Bay Project, the largest in the world - was excavated. The project took 9 years to complete (1966-74), employed more than 30 000 people and cost $950 million. The first units began transmitting December 1971; the eleventh and final unit went into service in 1974. With the dramatic rise in energy costs in the 1980s, Hydro-Québec has reaped huge profits from the resale of the power from Churchill Falls, and the terms of the contract were a source of acrimony between the governments of Newfoundland and Québec. In 1984 the Supreme Court of Canada ruled that a proposal by Newfoundland to divert water away from the falls was illegal. In March 1998, Québec and Newfoundland reached agreement on the development of a huge new hydroelectric project which promised to redress the inequities of the earlier deal.